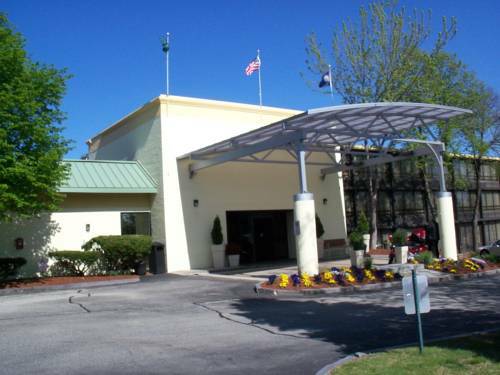 Free Wi-Fi Access Connects Hotel's Guests in Nashua, NHWhatever your reason for visiting, be it business or leisure, let the Holiday Inn� Hotel & Suites Nashua show you New England hospitality at its finest. Centrally located to all of New England, just off Everett Turnpike, we welcome guests with a warm and comfortable atmosphere.In Nashua, NH, the hotel's conveniently near all the local companies: BAE Systems, SkillSoft, Presstek, Fidelity Investments and Dell. Our business travelers appreciate the complimentary Wi-Fi access and multiple Business Centers. Our extended stay suites offer guests a home away from home-with fully equipped kitchens. Your meetings are sure to be a success with the impeccable service details and expansive event space.Leisure travelers find so much to do in and around Nashua, NH. The beauty of New England is just outside our doorstep, with New Hampshire's White Mountains, the Lake Region and the coast. There's always tax-free shopping in New Hampshire, too.During your stay at the Holiday Inn� Hotel & Suites Nashua, unwind with a pint at Killarney's Irish Pub. This long-time, local hotspot offers guests live entertainment, karaoke and trivia along with a full menu of classic Irish and American pub fare that delight every palate. Killarney's Cafe has a relaxed, family-friendly atmosphere where kids eat free and everyone finds something to enjoy. We look forward to welcoming you as our guest. Chef owned restaurant with a thoughtful and delicious menu for its guests, as well as an extensive wine list. Martha's Exchange and Brew Pub featuring hand crafted beers and hearty fare. From parking lot take a left, follow to 2nd light take a left at light follow East Dunstable Road to the end of road. Take a right onto Main Street, at rotary stay right follow for half a mile. Take a right after Wendy's into parking area. Towering ceilings with grand chandeliers and modern decor accent new carpet, accent this beautiful and newly renovated event space. The understated elegance is perfect for all occassions and events. Beautifully renovated from floor to ceiling with timeless elegance, the Granite State Ballroom is perfect for all events from corporate meetings to Weddings. Towering ceilings with crystal chandeliers accent the grandeur of the Granite State Ballroom. Flooded with natural light, the Franklin Pierce Room is a refreshing event space. The spacious yet intimate layout is perfect for both corporate and social groups alike. For intimate Wedding Receptions and Cocktail Parties, this is the ideal event space. The Robert Frost room offers an intimate atmoshpere for small groups. The perfect room for board meetings and small conferences as well as family gatherings. The Nashua Room is your office away from the office. This boardroom features modern plush office chairs for your comfort along side a large boardroom table. Enjoy a nice day visiting over 200 tax free shops. Visit the anchor stores or many smaller ones. You can also eat at the food court or visit one of the restaurants on site for a sit down meal. Enjoy hundreds of stores in the South Nashua area all tax free! Head to Old Navy, Marshalls, Home Depot, Lowes, The Paper Store, Buy Buy Baby and much much more! Shop the Christmas Tree Shop, LL Bean Outlet, Babies R Us, and much more! Nashua is tax free! Also includes Home Depot, Burlington Coat Factory. Bugaboo Creek Restaurant, Shorty's Mexican Roadhouse, Haluwa Chinese Rest. - SkyVenture New Hampshire "Indoor Skydiving"
The indoor vertical wind tunnel is not only used by the world�s best skydivers to train in but it was also designed for the general public to experience the sport of body flight. - Fenway Park (Boston) "Go Red Sox"
Catch a Red Sox game at HIstoric Fenway Park. Enjoy a day on the green! Relax in the open fields, or under an old oak tree. Bring your bike and ride some of the nature trails. There is even an area for a cook-out. Just bring the food and charcoal. Go Patriots! Root on he Patriots at Gillette Staduim! Stroll Main Street, Nashua NH, and explore eclectic shops and resturants. Enjoy brand name stores without the brand name price. Tax Free outlet shopping with leave you and your wallet satisfied. Opening June 2012! Where the rule-breaking little lamb was headed. Henry Ford dug up the little red schoolhouse and moved it here. Low-tech, packed with vehicles. Includes the behemoth 1918 Lombard Log Hauler, "New Hampshire's first snowmobile." HOw about that funky 1973 burnt orange Inovar Sno Coupe -- Superfly's snowmobile? America's only famous lamb, memorialized in the town where it lived. The first non-allegorical woman to get a statue in America. It marks the spot where a kidnapped pioneer mom turned the hatchet on her murdering captors.